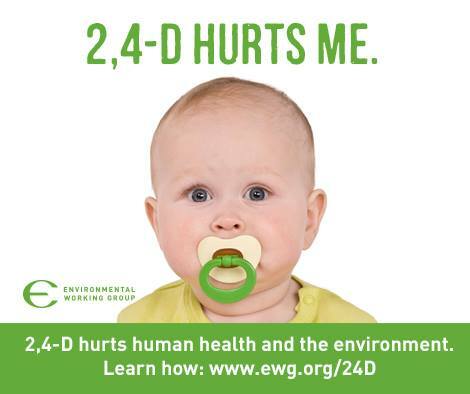 If approved, large-scale 2,4-D spraying on 2,4-D-resistant genetically engineered crops could have severe consequences for human health. Communities nearest GE and conventional agricultural fields, mostly in the Midwest, will bear the brunt of the hazards of 2,4-D.
Young children in homes, day care centers and schools would face the greatest health risks. A 2007 University of Minnesota study of farm families found that 2,4-D levels in the bodies of children between the ages of four and 12 years were about three times those of children 12 or older. Studies have detected that male farmers who worked with 2,4-D experienced disruption of the reproductive and the thyroid function, compared to men not exposed to this chemical. Research has also demonstrated that farmers exposed to 2,4-D had suppressed immune systems, which could weaken their defenses against various infections. A comprehensive review published earlier this year by researchers with the International Agency for Research on Cancer has shown that people exposed to 2,4-D and other agricultural pesticides are more likely to develop non-Hodgkin’s lymphoma. A study published in 2009 made a link between 2,4-D and Parkinson’s disease.